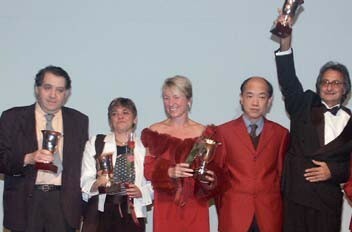 The World Transnational Mixed Teams was inaugurated in 1996. 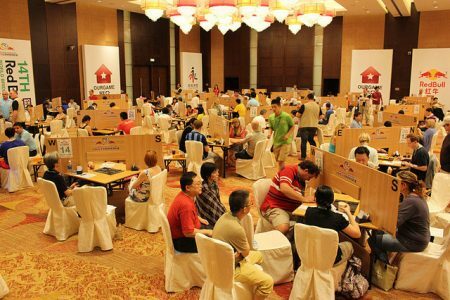 It was played up to 2012 during the second week of the World Bridge Games (formerly the World Teams Olympiad) and is also open to teams containing players from more than one NBO, playing in Mixed partnerships. 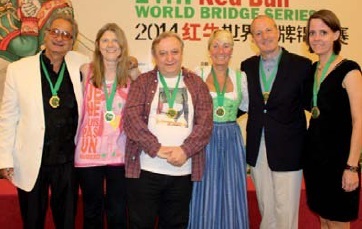 Since 2014 the championship is included in the World Bridge Series. 1. 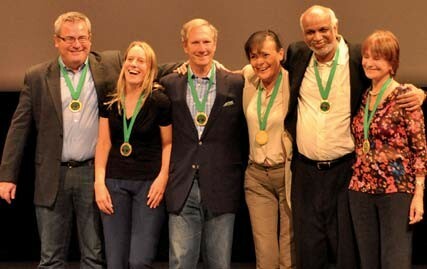 MANFIELD: Beth Palmer (pc), William Cole, Melanie Manfield, William Pettis, Debbie Rosenberg, Michael Rosenberg (USA). 2. WILSON: Sally Brock (England), Richard Ritmeijer (Netherlands), Magdalena Ticha (Netherlands), Ricco van Prooijen (Netherlands), Chris Willenken (USA), Alison Wilson (pc) (USA). 3: FERM: Sjoert Brink (pc) (Netherlands), Simon De Wijs (Netherlands), Bas Drijver (Netherlands), Barbara Ferm (USA), Christina Lund Madsen (Denmark), Daniela von Arnim (Germany). 1. SALVO: Anita Sinclair (Captain, England), Sabine Auken, Roy Welland (Germany), Zia Mahmood (USA), Marion Michielsen (Netherlands), Nafiz Zorlu (Turkey). 2. GEELY AUTOMOBILE: Gui Shen Yue (Captain), Dai Jianming, Wang Hongli, Wang Liping, Yang Lixin, Zhang Yu (China), Wang Wen Fei (Coach). 3. ROSSARD: Martine Rossard (Captain), Danielle Avon, Jean-Michel Voldoire, Jerzy Romanowski (France), Grazyna Brewiak, Wojciech Gawel (Poland). 3. SAIC: Hu Mao Yuan, Liu Yi Qian, Wang Weimin, Wang Wen Fei, Zhou Yong Mei, Zhuang Zejun (China), Huang Rong (NPC), Hu Jihong (Coach). 89 teams entered for the championship. 84 teams with players from 23 different countries entered the Transnational Mixed Teams in China. 1. Milner: Petra Hamman, Hemant Lall, Reese Milner, Gabriella Olivieri, Jacek Pszczola, Meike Wortel. 2. Canada: Judith Gartaganis, Nicholas Gartaganis, Daniel Korbel, Darren, Wolpert, Hazel Wolpert, Linda Wynston. 3. Saic Red: Jianming Dai, Mao Yuan Hu, Yi Qian Liu, Liping Wang, Wen Fei Wang, Zejun Zhuang. 1. Daniel Lavee, Connie Goldberg, Dale Johanessen, Greg Hinze, Lynn Johannesen, Jo Ann Sprung. 2. Irina Levitina, Ronald Smith, Jill Levin, Eddie Wold. 3. 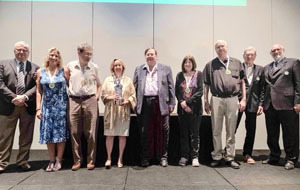 Jo Morse, Mike McNamara, Linda Gordon, Robb Gordon, Sylwia McNamara, Warren Oberfield. One hundred and twenty teams with players from 23 different countries entered the Transnational Mixed Teams in China. 1. Yeh Bros Team: Fang-Wen Gong, Seau- Fung Hu, Gloria Meng, Chih-Kuo Shen, Juei-Yu Shih, Chen Yeh. 2. Team Gromov: Andrei Gromov, Victoria Gromova, Tatiana Ponomareva, Alexander Dubinin, Svetlana Badrankova. 3. Team Evertrust Holdings: Xu Hou, Yan Huang, Gan Lin, Rongqiang Lin, Zheng Jun Shi, Zhang Xiaofeng. 1. Team Auken: Sabine Auken, Paul Chemla, Catherine d’Ovidio, Zia Mahmood. 2. Team Batov: Vasili Batov, Stiliana Ivanova, Julian Stefanov, Ralitza Mircheva. 3.Team Zhang: Qinghong Zhou, Ming Sun, Liping Wang, Zhong Fu, Weimin Wang, Yan Lu. 68 teams participated in the second World Transnational Mixed Teams. 1. Team “e-bridge” t: Pinhas Romik (NPC), John Mohan, Jill Meyers, Irina Levitina, Piotr Gawrys, Migry Zur Campanile, Sam Lev. 2. Catherine d’Ovidio, Michel Bessis, Véronique Bessis, Paul Chemla. 3. Sascha Wernle, Jovanka Smederevac, Andreas Glover, Martin Schifko. 1. A team from Great Britain and Iceland: Jon Baldursson, Björn Eysteinsson, Heather Dhondy, Elizabeth McGowan, Adalsteinn Jorgensen, Ragnar Hermannsson. 2. Team Feldman: Mark Feldman, Sharon Osberg, Rozanne, Bill Pollack. 3. Christine Nahmens, Alain Nahmias, Elizabeth Schaufelberger, Pierre Adad.